Plywood consists of several sheets of wood, glued one on top of another, alternating the wood grain on adjacent layers. Assembled around a central plate, there is always an odd number of plies. These two features give Plywood the following properties that are appreciated by cabinetmakers, builders, designers, artists, craftsmen: mechanical resistance (structures, buildings), flexibility (furniture), aesthetic beauty, water resistance and lightness. Plywood and laser cutting go hand-in-hand. 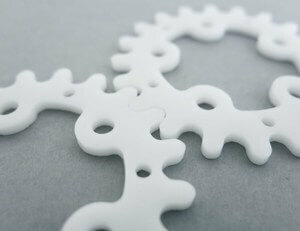 Laser cutting is precise and allows you to draw extremely fine curves. Engraving on plywood, possible with a laser cutting machine, allows for photo rendering or high-definition printing. The laser makes sharp, clear cuts, so no finishing work is necessary. Wood is a natural material. Wood grain varies from one board to the next, allowing you to give your plywood pieces a unique character. Please take a note that laser cuts the wood under a slight angle which may be visible on thicker parts. Your price for laser cutting and engraving is automatically calculated when you put your vector file online on our website. It is calculated interactively and depends on some factors, such as the amount of material used, the machine time needed to cut or engrave it, and logistics costs. You can see it change in real time as you make modifications to your vector file. To get the price of your item in just a few clicks, you just have to log in and upload your vector file . For laser cutting, we have two different catalogues : one for the materials we produce in our factory in France, and one for the ones we produce in our factory in the United States. According to whether you choose materials in either or both of those catalogues, your shipping time and cost will be modified. The time for cutting and engraving is approximately 2 working days for plywood produced in France , and 4 working days when it’s produced in the US . An additional period of 24 to 48 hours may be necessary depending on the size of your vector file. Based on the details of your engraving, the operation may take some time. The final time period is given on our website when you place your order. Delivery time is added to the laser cutting and engraving time and depends on the delivery method you choose, on whether you order from the French or American catalogue and on where you are located. Laser cutting involves cutting the material with a powerful and precise laser, which focuses on a small area of material and can cut a thickness of up to 15 mm. There are various laser sources that can be pulsed or continuous. Cut pieces are not deformed, because the laser's HAZ (or heat-affected zone) on the plywood is low (approximately 0.5 mm). At Sculpteo, we use 100W, CO2 laser cutters, because they allow us to cut all types of materials at a faster rate than pulsed laser cutters. Laser engraving is a subtractive method of manufacturing, which is based on the use of a laser beam to alter the surface of an object. This process allows you to create images visible to the naked eye on the object. The laser emits a fairly high degree of heat to pulverize the material, thus creating cavities that form the final image. It is a quick method, as the material is removed with each laser pulse. When you import your vector file, we will determine the areas to be engraved and cut under your control. To learn more, we invite you to read our information about vector file transfers. Plywood is characterized by its durability. It is flexible at the same time, because it is created from separate plies. You can use it for building, furniture, etc.However, the thickness of the plywood may make laser cutting difficult, so we have to be careful. The use of plywood in laser cutting is especially popular with the arts and crafts. Cutting is done without any wear, it's dust-free, and it's precise. Perfect finishes without any post-production operation facilitate and encourage its use. The slight oxidation (browning) of the cutting edges even gives the object a certain aesthetic. Plywood can be worked like solid wood: it can be sawed, nailed, screwed, glued, etc. The wood always works as a function of the relative humidity of the air, the temperature, exposure to light and air. Avoid major fluctuations in temperature and humidity. Like raw wood, plywood requires a minimum amount of protection. Protective waterproofing or water repellent products should do the trick. You can also apply a varnish. To clean a piece of plywood, use a clean, soft, lint-free cloth. If you have stubborn stains, you can use sandpaper, and you should sand in the direction of the wood grain. There are several types of plywood; one or more types of wood can be used to form these plates. At Sculpteo, we offer 4 single-species types of plywood: poplar, okoumé and ceiba wood (all of them are softwoods) produced in our factory in France, and maple, produced in our factory in the US. Poplar plywood : very light green in color, can be used for models, small furniture, decoration, and packaging. Poplar is a very soft wood, and it shows markings at the slightest stroke. It is more sensitive to moisture than okoumé is. Okoumé plywood : slightly pink in color, okoumé is an exotic wood, so therefore more expensive than poplar. Its use is recognized for demanding work, and like poplar, can be used in models, small furniture, decoration, and packaging. Maple plywood: light brown in color, maple is a precious wood. Like the other woods, it can be used for models, small furniture, decoration, and packaging. Baltic Birch: light yellow in color, has better mechanical properties than Maple, although has more raw surface. 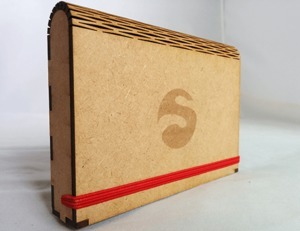 Like our other Plywoods can be used for small crafting projects, decorations and packaging. Plywood thickness values are indicative. The process of obtaining the plywood does not guarantee good tolerances on the sheet thickness (roughly 1 mm to 3 mm nominal). For this reason, if your project includes parts that need to fit together tightly, we recommend you use MDF and not plywood. MDF has a much stable thickness, which means you'll be assured that your parts fit properly. However, if you're hesitating between MDF and Plywood, also consider that Plywood will look better when it comes to engraving. To glue two plywood planks to each other, you can use wood glue or another type (PPU, Epoxy). Whatever type of glue you use, you should put the wood under pressure (a clamp or wood facing). It is easy to paint plywood. After preparing it with primer, you can use acrylic paint, which dries quickly. The acrylic paint should be thorough enough to fill the wood's pores. If you want to paint details, the wood ridges may be a disadvantage. Laser cuts and engraves material by burning its surface. Therefore, the sides of the piece tend to be darkened, and are marked slightly on the edges. Sometimes, marks appear on the cutting line. The sides of the part cut in Plywood might stain skin or clothes, as a thin layer of black wood powder remains on the part. When burning the surface, the laser also leaves a kerf of a width that can vary, depending on the type of material and the thickness chosen. When designing your project, you need to take this kerf into account, and plan for a surplus of material accordingly. The following chart lists the kerf sizes for Plywood in function of the thickness. About the laser's precision and its effect on the material, you also need to keep in mind that your object might get some burning stains on their inner side. The maximum size of your designs is limited by the dimensions of the machine's cutting table. Your designs must abide by the measures below in order to be cut/engraved by our machines. Minimal dimensions may be necessary for laser cutting, but not for engraving. When you load your design onto our website in order to have it cut, we can't detect, based only on the information contained in the file, whether you wish to keep the outer or inner surface. Therefore, if you wish to keep the inner surface, you must respect minimal dimensions. Indeed, if the surface is too small, it could be lost under the cutting table's grid. If you wish to keep only the outer surface, this constraint does not apply. Be very careful to respect the minimum size of 15x15 mm: objects of this size are all susceptible to not be delivered. Disclaimer: due to the machine’s process, some marks and scratches may occur on your object. Because of the kerf created by the laser, a minimum distance is required between two lines, whether it is for cutting or engraving, in order to prevent the lines from touching or mixing. You can refer to our tutorial for more precision and guidance for your vector construction. Double check the aforementioned kerf constraint and respect the minimal distance between two lines. It is possible to cut/engrave texts. These texts must be vectorized, just like all the files sent onto the website in order to be cut or engraved. For laser cutting , it is key to take the kerf into account when designing your text. The texts must be treated like shapes: they must be vectorised and respect the same rules as every other shape (see tutorial). As for full letters (A, D, O, B...) remember to create links between the inside and the outside of the letter (see below), so that the center doesn't get detached from the rest of the letter. These links are necessary if you wish to keep the outer part of the cut (we'll call it the stencil). So that your text looks best and harmonized, you can create similar links all over the text, even on letters that don't need them. These links are really simple to create on your own, but you can also use a font like STENCIL, in which they already exist. You'll find such fonts with a simple internet search. To get an approximation of the kerf, you can temporarily apply a 1,2 pt thickness to your letters. Line engraving : ideal to engrave a contour. It's the same operation as cutting, with less power. For this type of engraving, use our cutting tips when designing your file. On our website, only one line engraving level is available. Surface engraving (also known as infill engraving): For this type of engraving, the outline of your design must absolutely be closed. 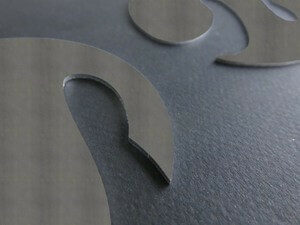 We offer two levels of surface engraving depth: superficial or deep. With the superficial level, the cut can barely be felt by touch, whereas it is noticeable with the deep level. Make sure you incorporate different colors in your vectorial design, according to whether you want a cut, an engraving line or a surface engraving. The pieces that are cut can then be assembled. In order to do that you must plan for a minimum space between each of the pieces to assemble. This space must be larger if you want your pieces to be mobile. Make sure to build your design in a way that allows space for the kerf. For more information on pieces assembly, we invite you to visit our tutorial on how to prepare a model for laser cutting on Illustrator or Inkscape. Plywood thickness values are indicative. The process of obtaining the plywood does not guarantee good tolerances on the sheet thickness (roughly 1 mm to 3 mm nominal). It is strongly recommended to use the MDF material for assemblies. If you wish to make Plywood pieces fit into each other and make sure they’ll stay connected, we recommend that you add in nodes. Nodes are small bumps situated in a piece’s slots or tabs, that allow to compensate the thickness variations of the material and the kerf. Nodes get compressed when the pieces are assembled and they concentrate the friction on specific points rather than on the slot’s whole surface. This way, the slots can be larger without coming apart, allowing the pieces to stay together. In order to make sure the pieces stay fixed, you must place the nodes on each side of the slot opposite to one another. Depending on the length of the slot, you can place several nodes. This will minimize the tension that could potentially occur if the nods were not aligned or if one was missing. They must be smooth and long enough to ease the interlocking. Depending on the material’s density, the nodes’ width may be increased or decreased. The higher the material’s density, the smaller the nodes’ width should be. It is possible to cut or engrave several objects designed in the same vector file, by attributing one different color for each action, as indicated on the tutorial how to upload and prepare your 2D file . 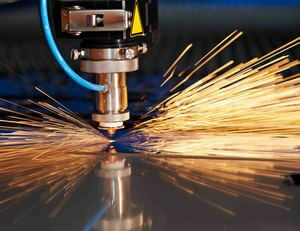 Steel has excellent strengh capacities and allows solid laser cutting parts. It is used in many industries such as engineering and building.